Reports have pointed us towards expecting the next Amazon Kindle Fire to launch this fall, and today we may just have the tablet's specs on hand. A pleasant surprise for a slate that has so far remained fairly mysterious: It looks more akin to the Kindle Fire HD than its entry-level predecessors. According to BGR, the third-gen Kindle Fire will be a big improvement, although it will stick with a Texas Instruments processor similar to the ones used in past Fire tabs. The new Kindle Fire will reportedly feature the same chipset that powers the current Kindle Fire HD lineup, a 1.5GHz dual-core Texas Instruments OMAP4 4470 processor with PowerVR SGX544 graphics. It will also feature a higher resolution screen, matching the current Fire HD at 1280 x 800. All this puts the new Kindle Fire on essentially the same level as the current Kindle Fire HD, with the new Kindle Fire HD 2 on a tier above even that with an improved 1920 x 1200 display. 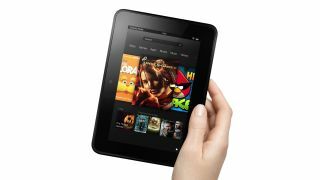 That said, the upcoming Kindle Fire will unfortunately stay stuck at 1GB of RAM, according to the publication. It will, at least, feature Android 4.2.2: Jelly Bean. Pricing is said to be staying the same for the 8GB model, which will again be offered at $159 (about £102, AU$173), though there may also be 16GB and 32GB models at unknown price points. Along with some basic aesthetic design changes and the rumor that it will be the last Amazon tablet to use a TI processor, that's all we've heard of the new Kindle Fire. BGR's intel comes from "trusted sources," but of course the information could turn out to be bogus. Those looking for a new Kindle Fire (which Amazon will very likely launch before the holidays) should be heartened as none of these claims sound too outrageous. Wondering which affordable, small-form tablet to get? TechRadar compares the Nexus 7 vs. the iPad mini vs. the Kindle Fire HD.